The Pearl South Pacific offers guests the majesty of a tropical island environment with uniquely designed suites, exceptional service standards and genuinely sophisticated cuisine. It is the perfect combination of the comfort and facilities of a hotel, with the privacy and hospitality of a boutique retreat. The Resort is situated on the coast of beautiful Beqa lagoon, just 40 minutes drive from Suva and 2.5 hours drive from Nadi. Located absolute beachfront on what is arguably Fiji’s longest white sandy beach. From all entertainment areas, you will enjoy the uninterrupted views and breath-taking beauty of Beqa and Yanuca Islands. The interiors are fresh with white backgrounds interlaced with rich browns, reds and creams and finished with high quality fabrics, leather and wood. Oversized day beds, comfy sofas, and large coffee tables are scattered throughout the resort for guests to lounge back and enjoy, whilst taking in the views of the beach, river and gardens. 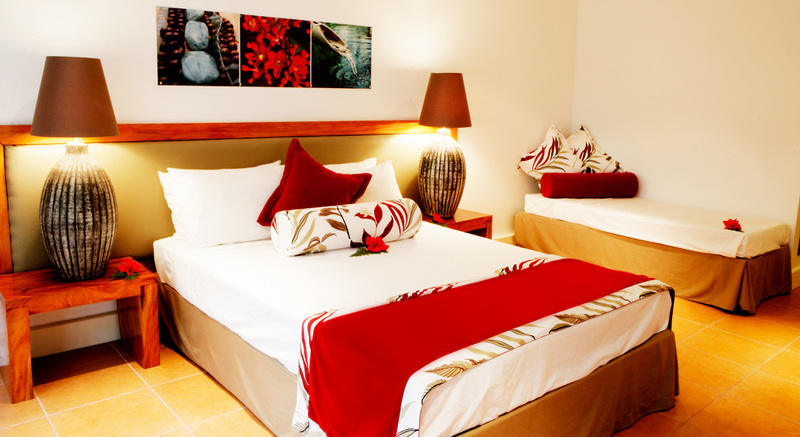 The resort offers both Garden and Ocean View rooms, as well as their lovely Garden and Ocean View Penthouse Suites. The dynamics of the hotel are relaxation, adventure and a place to unwind. The fully licensed restaurants and bars overlook the pool, lush gardens, the beach and river. With plenty of local seafood to savor and an ever-changing menu, the chefs love to cater to patrons’ personal tastes whilst introducing the region’s sumptuous produce. Continental breakfast is included in the daily tariff. The Pearl South Pacific Resort enjoys a unique tropical oasis that embraces, romance, re-generation & a passion for life. Together with year round warm weather, it makes the ideal setting for your wedding. Choose from a variety of venues, with different backdrops and ambiences, then choose the package that best suits you. The in-house sports & leisure programs include extensive activities and pampering packages, as well as access to the best adventure sports in Fiji including white water rafting, deep sea fi shing, diving and surfi ng. The Pearl South Pacific is also home to the Robert Trent Jones Jr. designed 18 hole championship golf course, cycling, events centre, cinema, media centre and a small boutique. The Pearl Spa offers Pure Fiji products, internationally trained therapists and the Gym features state-of-the-art equipment. Children are permitted at this resort year round. Nannies are available and the resort asks for advance notice so that all of your needs are met to perfection!